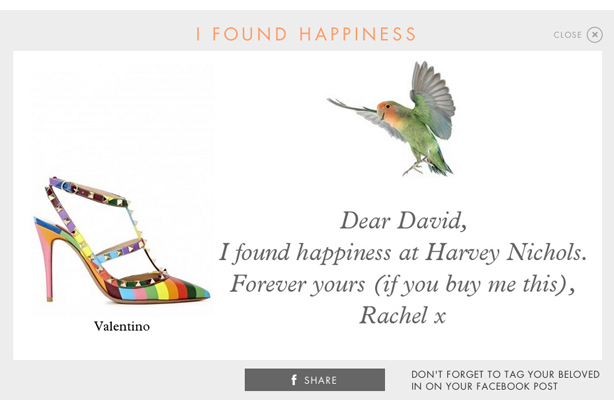 Harvey Nichols has launched its Valentine's Day campaign, which allows customers to click on a product link to send a not-so-subtle hint to their partner. The retailer carried out research which found that one in three men do not know what to buy their partners for Valentine’s Day, and nearly half of the women surveyed were unhappy with last year’s gifts. The 'happiness hint generator' is embedded into all products on the website so that consumers can click "send a hint" on the gift they want. Customers enter their own name and their partner’s name, then the online generator will create a Valentine’s card featuring the chosen gift and a hint for the recipient. Rachel Roe, group head of internal comms at Harvey Nichols, said that it was a "purely social" campaign, with cards being shared on Facebook rather than via email. Shadi Halliwell, group creative and marketing director of Harvey Nichols, said: "With our ‘happiness hint generator’ you can cheekily spell out that stylish gift you’ve always wanted."